At Pullamangai, the panel that follows Rama and his entourage’s departure to Ayodhya represents an indigenous event not discussed in literatures. In this panel, Rama engages in fierce confrontation with a group of rivals who challenge him and proves his indomitable strength yet another time. The rivals are defeated and run away from the field. The sculpture does not seem to be a portrayal of Rama’s meeting with Parasurama – an event detailed by both Valmiki and Kambar. It should be regarded as an indigenous/localized variation of Rama’s story. The portrayal is peculiar to Pullamangai Ramayana and is not featured in other early Chola Ramayana narratives. Panel Segment: Galapada in the Bhadra segment, facing west. Placement: Not significant. Hidden from the eyes of the spectator facing the Mandapa Wall. There are five characters in this panel, out of which three are more prominent than the rest. The most dominant figure standing in Aleeda and bending his bow - should be considered as Rama. He is occupying more than one half of the space available. Holding the bow firmly in left hand, he is aiming at the skies and stretching the bow string with his right. The extreme bend shown on the bow clearly indicates that it has been stretched to its limits. The firm and fully stretched body posture of Rama reveals his exertion. This would be his fifth Aleeda posture at Pullamangai, the earlier ones being Nos.8, 10, 12 and 17. In terms of overall energy and dynamism, this panel surpasses all earlier ones – even No.17 in which Rama breaks Shiva’s bow at Mithila. Obviously the situation has prompted him to deliver a severe and punitive response. Two male characters with matted locked hair (Jatamakuta) are seen on either side of Rama – below his hip level. The one to his right (wearing Patra Kundala) looks terrified and is crawling on the ground - raising his head slightly to look at Rama in absolute fear. His left hand is raised – showing Vismaya posture. He should have confronted Rama little earlier; now, unable to withstand the ferocity of response from Rama, he has fallen down and is wondering in amazement. His posture suggests that he is trying to escape from the scene. The one to the left of Rama is almost falling at his feet. Unable to fight anymore, he is acknowledging the defeat. It is clear that both had challenged Rama and attempted to fight with him. Their provocation should have prompted Rama to provide a definitive response, which caused the first one to escape from the field and the other to fall on the ground. Further away, two male figures are standing with Jatamakuta and Patra Kundalas. Both are witnessing Rama’s demonstration at a distance. 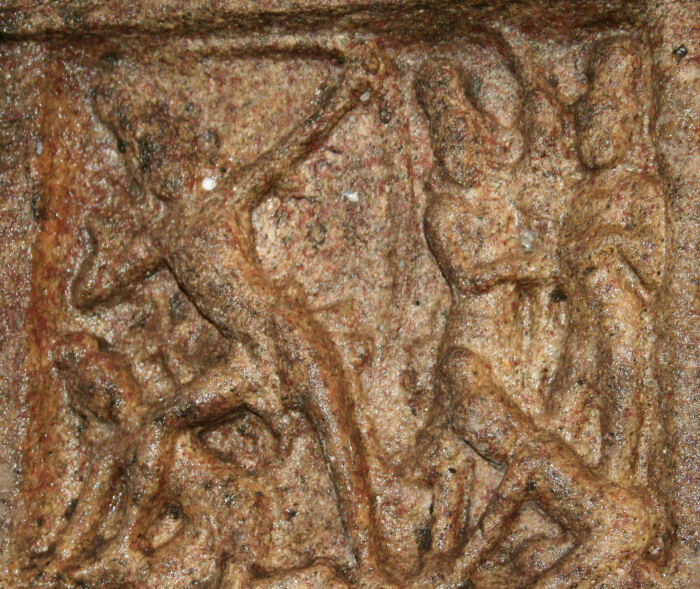 The first figure with tall Jatamakuta and Patra Kundalas holding the bow – is in a state of total withdrawal. Tiling his head down, he is looking at the figure who has fallen to the ground in fear and astonishment. He should have also contemplated on confronting Rama earlier – as indicated by the bow on his hand. But the fiery demonstration has clearly proved that he doesn’t have a chance. So he is dropping the idea and moving away. The last figure standing next to him is the only character who looks somewhat relaxed and composed in this entire composition. He is also witnessing the event with great attention - but there is no fear or sense of withdrawal in him. Obviously he is the only one who was aware of Rama’s strength and did not contemplate on challenging him. He is witnessing the event with awe and inspiration. The whole scene is an eventful portrayal of how three male characters challenged and confronted Rama and the fate they eventually met with. The significant event in literatures following Rama’s marriage with Seetha – is the meeting with Parasurama on his way to Ayodhya. It is probably the only occasion in which one manifestation [avatar] of Vishnu meets another, in person. Parasurama not only meets Rama but challenges his might and prowess. Not convinced with Rama display of strength in breaking Shiva’s bow, Parasurama challenges the young prince to break the Vishnu bow he carries. Rama stands up to the trial and manages to break the same, thereby proving that he is also a manifestation of divinity – just like the Sage. Parasurama realizes the true facet of Rama, blesses him and resorts to penance. 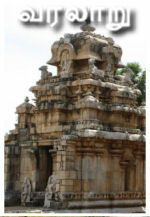 Kambar dedicates an entire Padalam to cover the details. [Bala Kandam: Parasurama Padalam]. Comparing the event detailed in literatures with the portrayal at Pullamangai, it becomes immensely clear that the two are totally unrelated. None of the four characters (excluding Rama) portrayed in the panel are looking like a sage and none are wielding an Axe – a weapon that characterizes Parasurama. Hence none of them can be identified with Parasurama. The eventful portrayal should be understood as a multi-part event that consists of a series of incidents that happened one after another – eventually culminating in a climax, which is captured here. The questions that need to be answered are: Who are these male characters? Why did they choose to confront Rama and what is the need for doing so? And why one character is leaving the field with such a reluctance? With the current set of evidences it is difficult to provide definitive answers to these questions. Further research is required. In dramas, various incidents and events that happen over a period of time can be narrated one after another in quick succession. The stage provides necessary space required to position various characters in the desired locations, so as to narrate the sequence of events effectively. It is often noticed that the prominent characters in a given scene tend to come forward and occupy the front stage to perform - while the supporting cast remain in the background. When such narratives are transferred to the stone medium, the sculptors have to employ some intelligent means to bring about the concept of space and time – as seen in dramas. The simplest and the most obvious method is to portray successive events as a series of narrative sculptures – so that a spectator can connect the portrayals and contemplate the underlying story. The location at which the story begins and the direction in which the story progresses (clockwise/ anti-clockwise) are two important facets of such visual narratives. However, there is another more subtle and less obvious method of emphasizing this concept and this method has been employed by the Chola sculptors at select panels – such as the one under discussion (No.23). In this portrayal, Rama is projected well out of the stone wall – as seen by the depth near his right chest and hip. The bow is also projected out. The overall suggestion is that he is the most prominent character, occupying the front stage. His forceful display of strength is the current moment that has been frozen by the sculptor. His demonstration is happening in the left side of the stage – from the spectator’s view point. The one who is crawling on the ground is depicted behind Rama – as emphasized by the depth of Rama’s calf muscles. Thus he is occupying the back stage and represents an event which had already happened. i.e. he had already been defeated and is running away. His defeat is the first incident in this whole sequence. The current moment happens after his defeat. The one prostrating before Rama is connected with the current scene. His falling to the ground is in response to Rama’s demonstration. He is almost occupying the front stage along with Rama. His prostration helps to highlight the victory of Rama. The figure who is on the right side of the stage and is withdrawing from the scene signifies an event that follows the current moment. He has seen the fate of his colleagues and is dropping the idea of confrontation and moving away. He is further behind the first three characters.